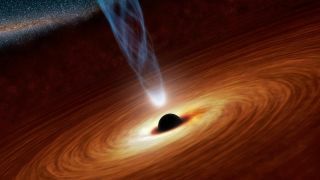 An artist’s impression of a supermassive black hole at the centre surrounded by matter flowing onto the black hole in what is termed an accretion disk. Also shown is an outflowing jet of energetic particles, believed to be powered by the black hole's spin. A newly discovered way to determine the spin of monster black holes could help shed light on the evolution of these bizarre objects and the galaxies they anchor. Astronomers watched as a black hole that sits at the core of a spiral galaxy 500 million light-years from Earth gobbled up gas and dust from its surrounding accretion disk. They were able to measure the distance between the inner edge of the disk and the black hole, which, in turn, allowed them to estimate the black hole's spin. Researchers said the technique could help astronomers address broad questions about galactic evolution, which is intimately tied to the growth and activity of the supermassive black holes that lurk at the heart of most, if not all, galaxies. "Understanding this connection between stars in a galaxy and the growth of a black hole, and vice versa, is the key to understanding how galaxies form throughout cosmic time," Done said. Done and her colleagues used the European Space Agency's XMM-Newton satellite to study the distant supermassive black hole, which contains as much mass as 10 million suns. This black hole blasts out prodigious amounts of energy as it feeds on the material in its accretion disk. XMM-Newton observed this output in optical, ultraviolet and X-ray wavelengths, enabling the astronomers to measure how far the disk sits from the black hole. Astronomers have calculated the spin of supermassive black holes before. In February, for example, a different research team determined the rotation rate of the black hole at the center of a spiral galaxy called NGC 1365. That group inferred the spin speed by measuring the distortion of high-energy light emitted by iron atoms in the accretion disk. It's tough to describe black-hole spin rates because they don't really translate into familiar terms, such as miles per hour. For example, the NGC 1365 team, which used observations by XMM-Newton and NASA's NuStar spacecraft, found the black hole's rotation rate to be 84 percent of the maximum allowed by Einstein's theory of general relativity. In the new study, Done and her team estimated that the black hole found 500 million light-years away — which is powering a superluminous "active galactic nucleus" known as PG1244+026 — has a relatively low spin rate. "This contrasts with the recent X-ray determinations of (close to) maximal black hole spin in other [similar galaxies] based on relativistic smearing of the iron profile," the researchers wrote in the study, which was published online today (July 29) in the journal Monthly Notices of the Royal Astronomical Society. "Better high-energy data are required in order to determine whether this new method gives a spin estimate which is consistent with that derived from the iron line, or whether it instead reveals a lack of understanding of disc continuum emission and/or of disc reflection," the team wrote.